Dr. Southern quickly becomes “Tom” from his frequent visits to my hospital-hotel room, and then daily visits to his office once I’m released from Methodist. Later that year, we even go to see him at his home in Indianapolis and his cottage on Lake Winnipesaukee in New Hampshire. Not only is he the very best burn-and-plastic surgeon in my world, he’s also an incredibly genuine, warm, and calm man. When Tom tells you something, even if you’ve just met him, you trust what he says. You believe him. He’s just that kind of person. Unfortunately. Because I just didn’t want to believe what he was saying. A couple of friends from Vancouver had flown in for the first weekend of qualifying, and now they came to visit. Once their initial shock at seeing my badly blistered face subsided, it was nice to have them to talk to. But I must have still had a lot of morphine in my system because my memory of that weekend is made up of short clips. I’m released from Methodist on Monday, a little over three days after my high-speed human barbeque. Robin has spent the entire time in our luxury suite (she had her own mini-suite off to the side of the main room). We are going to miss the food, as it has been some of the best we ate during our entire time in Indianapolis. I’m sure it isn’t just the painkillers that make me think that way because Robin agrees. We return to the nearby apartment that we’ve rented for the month, and that evening Robin begins what becomes a twice-daily routine of unwrapping the gauze from my hands and neck, applying medicated cream, and rewrapping them. The first time I saw my hands after the accident, I got grossed out, as the ends of my fingers resembled hamburger meat. There appeared to be no skin left, just raw flesh. For the next few days Robin also takes me back to Tom’s office so he can pick certain bits of burnt skin away from my face and then apply some magic cream that seems to heal things very quickly. He is very choosey about which bits of skin to pick off and trim down, and which to leave. I’m sure the fact that my face didn’t end up exactly like the Elephant Man’s is due to his painstaking attention. On Thursday, I have Robin drive me to the track. As I walk into Gasoline Alley, spectators and crew members alike turn to stare at me. With my hands completely swathed in white gauze, my neck wrapped as well, and my face blistered, red, and full of half-formed scabs, I am quite a sight, still. I watch as my teammates Eric Bachelart and Robbie Buhl practice. Both of them have had their engines blow up, sending the cars back to the garage where our crew set to work replacing them with new ones. 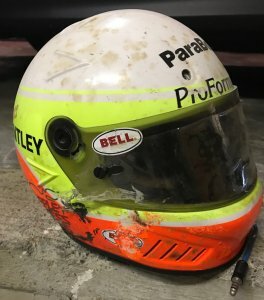 The previous Thursday was when Robbie’s engine blew, causing him to lose control of his car and plow directly into Turn 2’s concrete wall at over 200 mph. Having suffered a concussion from the impact, he had spent a night in the very same room at Methodist where I moved into two days later. This was his first day back practicing. Even more ironic, on the Monday that I was released from Methodist, Eric had had his engine blow up as well, causing him to spin out and nose his car into the wall—and injure his ankles. He too spent a night in what we started to call the Dale Coyne Racing Suite at Methodist. While hundreds of Speedway drivers have visited this venerable hospital over the decades of Indy racing, I doubt any other team has had all three of its drivers spend time in the exact same hospital room in the same month. With my teammates done for the day, it was time to head to Tom’s office for my daily face-pick. In the middle of my treatment, I told him that I needed to get back in my car and qualify this coming weekend. Tom smiled subtly. A look of “I knew this was coming” crossed over his face. Yes, I’m cleared to drive! Come back next week for Part 5 of my Indy story.